Everyone knows litter is a problem, but not everyone may understand just how big of a problem plastic litter (including plastic bags) is, especially in our oceans. It can be easy to overlook the problem of plastic litter in oceans since most people don’t spend extended amounts of time on the open water. Still, when trash enters the water it gets caught up in gyres or ocean currents, creating a big flotilla of plastic garbage. As trash is caught and churns within this massive heap of garbage one plastic bag can break apart into thousands of smaller pieces of plastic, and each of these smaller pieces can wreak havoc within the ocean, as well as far beyond the water. Trash that floats on the surface is a problem for animals like many species of birds that hunt prey near the surface. Birds mistake disposable plastic bags as prey and when they swoop down to grab it, the bird sometimes ingests the plastic or becomes tangled. This is a major problem but single-use plastic bags don’t always stay near the surface. Just because the water’s surface looks clean and clear doesn’t mean the same is true below. 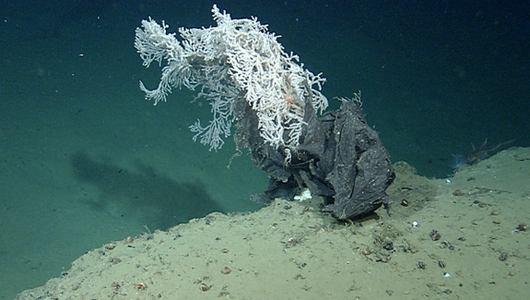 Disposable plastic bags can easily become tangled in plants or rocks on the ocean floor, and again may be ingested by animals feeding on the plants or living within the rock outcroppings. Remember also that plastic bags will break down into microscopic pieces which will stay in our ocean for generations. Since our oceans provide 99% of the Earth’s living space, it is the largest space in our universe known to be inhabited by living organisms. We must delve deeper into our oceans to understand what lurks beneath the surface and work to protect the life that exists there and even our own lives from plastic pollution. When animals consume single-use plastic bags, there is a very strong likelihood that the animal will die. The plastic litter may block the animal’s digestive system, or if the animal becomes stuck and tangled in the thin film of single-use plastic bags it is possible that the animal will be unable to fend for, or defend, itself. There are also a lot of unknowns regarding what happens when animals eat plastic. 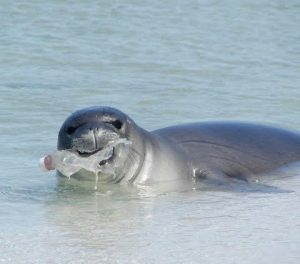 Scientific study after study has shown that animals pulled from the ocean have some type of plastic in their stomachs. Disposable plastic bags are not biodegradable and plastic particles do not breakdown in an animal’s digestive system. So while plastic ingestion does not necessary spell a certain death for animals, no one really knows for certain what ill effects that plastic can have on that animal, the offspring of that animal and animals further down on the food chain…like us. The flimsy, single use plastic bags break down into small plastic particles which are ingested by small animals in the ocean. Once those small animals are ingested by even larger animals, our entire food chain is potentially impacted. Do you like seafood? Do you like plastic? What impact will the chemicals that go into creating that plastic bag have on our future health let alone our ocean? Regardless of the form, plastic can be dangerous when it is not disposed of properly. Unfortunately, due to the lightweight film disposable plastic bags are constructed from, this form of plastic can be especially harmful since it can easily be transported by wind or water. It is so important to recycle all types of plastic but this is especially true of single-use plastic bags. When disposable plastic bags are recycled, the material can be re-used to create new and useful products that will not litter habitats and cause serious environmental harm. Another great way to reduce the impact of single-use plastic bags on the environment is to stop using these bags. Consumers and businesses alike can make the switch to sustainable options, like reusable grocery bags which will work to greatly reduce the need of disposable plastic bags and in time this reduced demand could eliminate the need while saving our future health. Previous Previous post: Why Are Reusable Bags Better than Single Use Plastic Bags? How Likely is it That California Will Become the First State to Ban Single Use Plastic Bags?